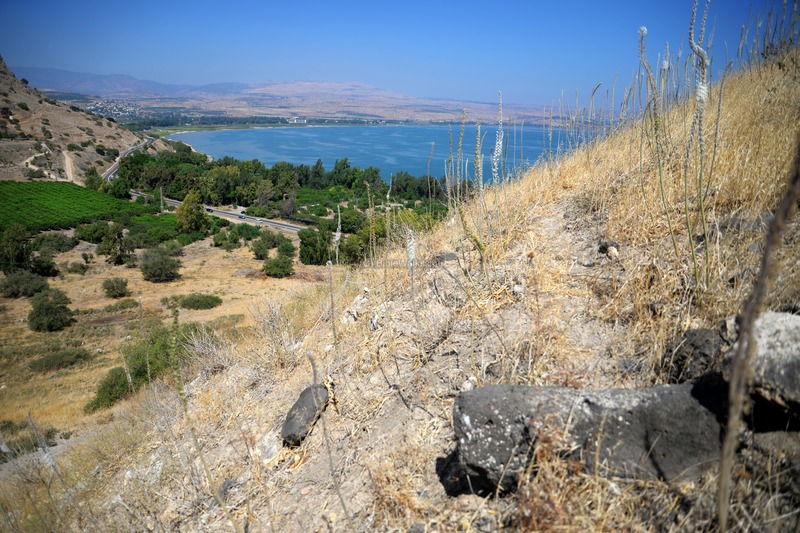 Ruins of a Biblical city on the shore of sea of Galilee, located on the ancient road from east to west. 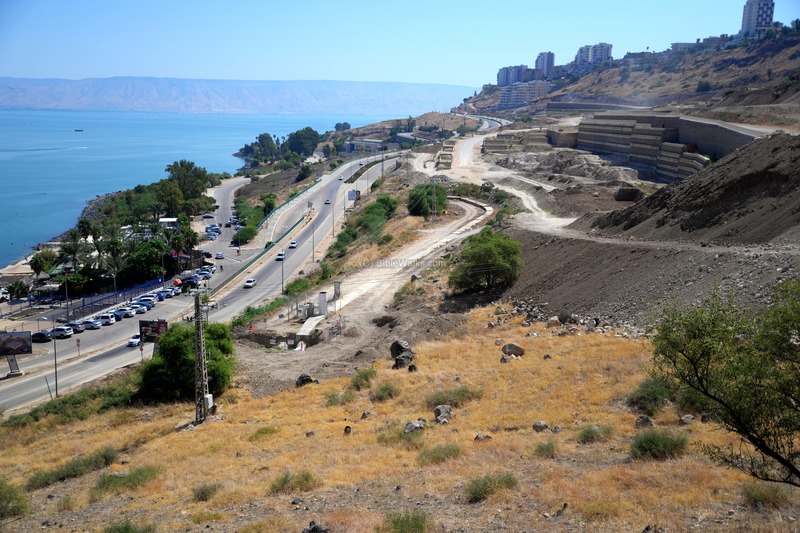 Its importance was in the Biblical period, and it declined after the establishment of Tiberias. Joshua 19 36: "And the fortified cities were Ziddim-zer, and Hammath, and Rakkath, and Chinnereth"
Tel Rakkath (Raqqat) was an ancient city on the shore of the sea of Galilee, dating to the Bronze and Iron ages. It was strategically located on a steep hill commanding major ancient routes. According to the Bible, it was a fortified Israelite city in the region of the tribe of Naphtali (Naftali). 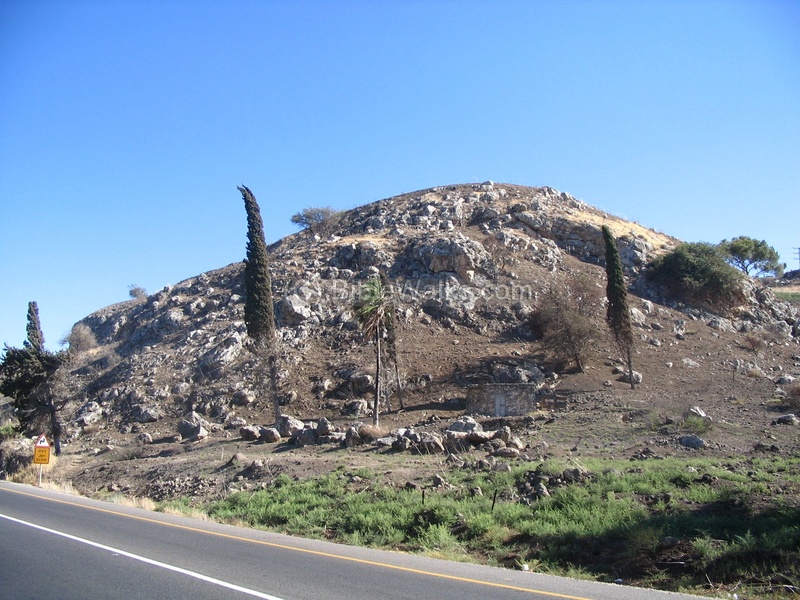 Tel (Mound) Rakkath is located between Tiberias and Magdala. 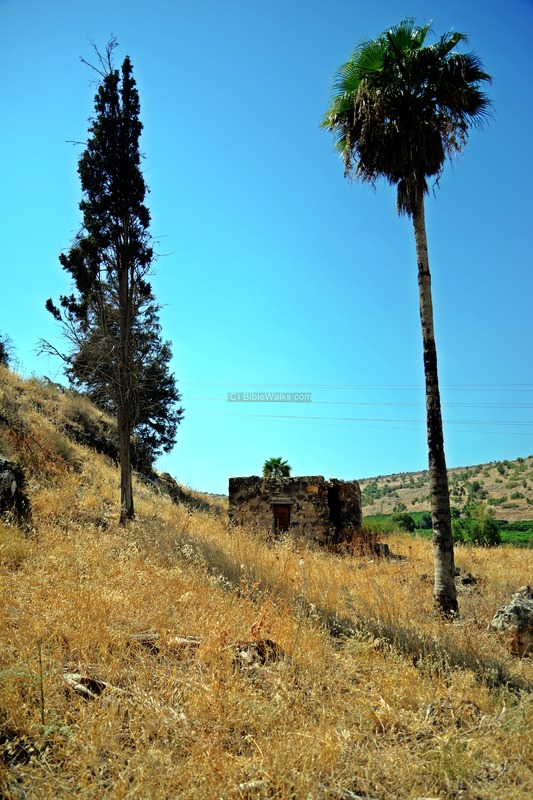 It is located on a steep hill that falls into the shore of the sea of Galilee, and on the entrance to the valley of Rakkath stream which flows from the plains of Arbel. This aerial map indicates the major points of interest around the site. You can point on the yellow squares to navigate to the selected place within this page. The city was inhabited from the Early Bronze period (3rd millennium BC) thru the Israelite period (1st millennium BC) . Identification: The Bible identified Rakkath within the tribe of Naphtali (Naftali), in a place between Hamat Tiberias (south of Tiberias) and Tel Kinneret (north west corner of the Sea of Galilee). This description was the basis of the identification of this site with the Biblical Rakkath, which according to the text was a fortified city (Joshua 19, 32, 36): "The sixth lot came out for the children of Naphtali, even for the children of Naphtali according to their families.... And the fortified cities were Ziddim-zer, and Hammath, and Rakkath, and Chinnereth". 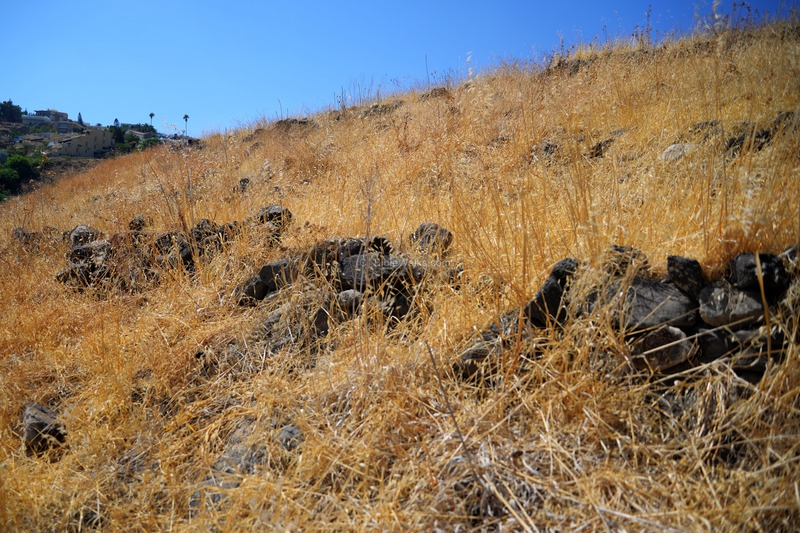 The Talmud - the 5th century AD books of religious practices, an extension and interpretation of the earlier texts of the Mishna - located it near Tiberias (Megila 2,2), agreeing with the suggested location on this hill. However, it has another verse (Megila 1) where Rakkath was located in another location. 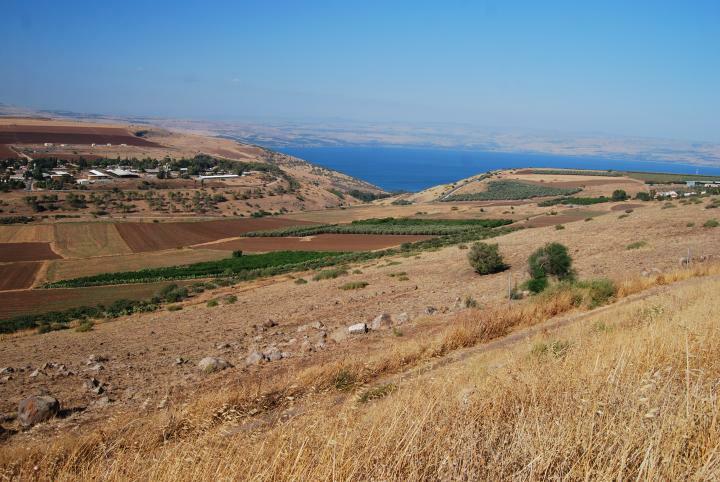 An major ancient road passed by the narrow land between the eastern edge of the hill and the Sea of Galilee. It connected the south to the North of Israel via Hammath/Tiberias. 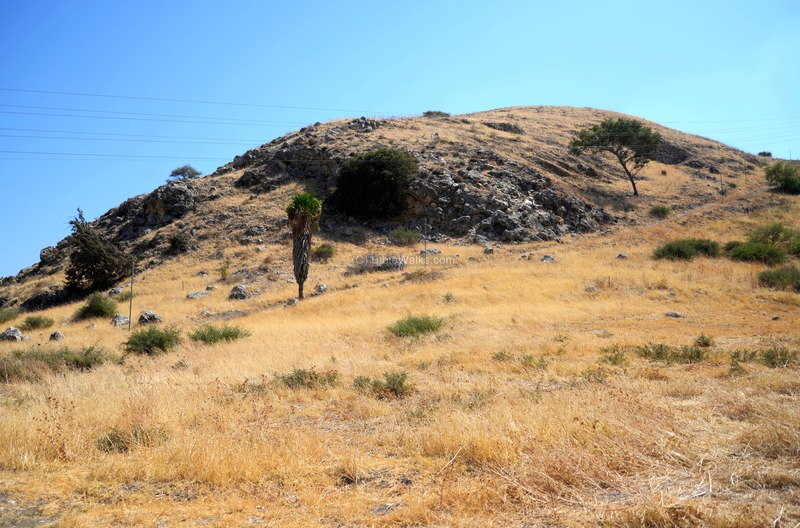 Another road, not shown in the map, ascended from the north side of Rakkath to the west, and was an alternative route to the northern path from Magdala around the north side of the Arbel mountain. "In the days of Pekah king of Israel came Tiglathpileser king of Assyria, and took Ijon, and Abelbethmaachah, and Janoah, and Kedesh, and Hazor, and Gilead, and Galilee, all the land of Naphtali, and carried them captive to Assyria.". The site was not yet excavated, except for a section where highway 90 crosses the lower side of the eastern foothills. Future explorations would provide more information on the site. The ancient city declined during the Iron Age and was abandoned. It relocated to the south, after Tiberias was founded in 18 AD by Herod Antipas, son of Herod the great and Jewish ruler of the Galilee (4 BC-39 AD). The site was examined in the PEF survey (1866-1877) by Wilson, Conder and Kitchener. It appears here in the center of the section of this map of 1878. The ruin is named "Khirbet el Kaneitriyeh" and the spring is named "'Ain el Fuliyeh". 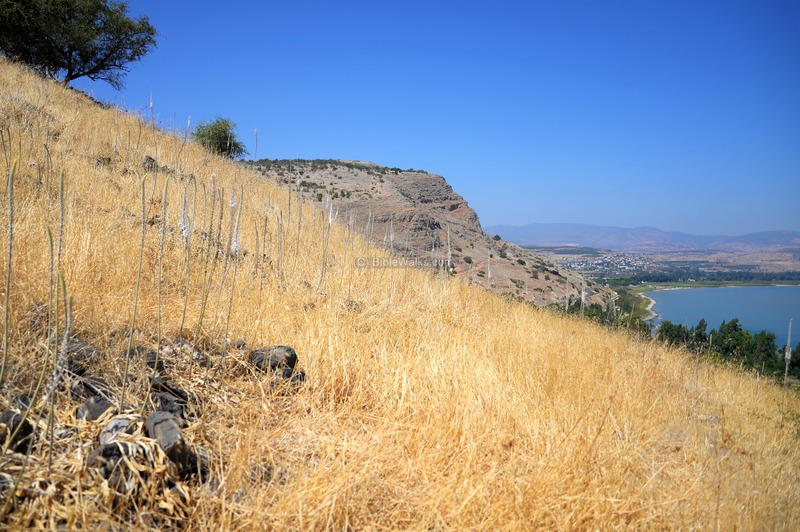 An ancient road, marked by a double dashed line, passes on the foothills of the site, connecting Tiberias and el Mejdel (Magada). Another road approaches and connects to it from the left (west). "Kh. 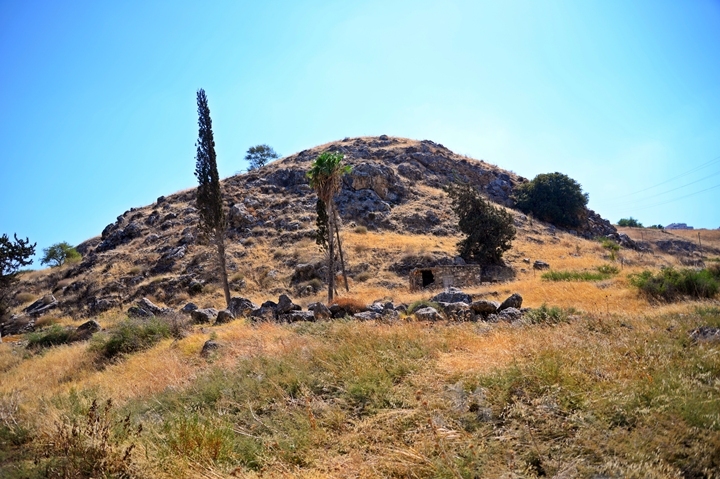 el Kaneitriyeh -Foundations and heaps of stones, on a round hill with steep sides". "'Ain el Fuliyeh, or 'Ain el Berdeh—This is a spring close to the shore of the sea. It has a good perennial supply of water. Under the name 'Ain Barideh ('the Cold Spring'), 'Ain el Fuliyeh ('the Spring of the Bean') is described by Captain Wilson, in 1870 ('Recovery of Jerusalem,' p. 359). It is within a few yards of the lake, and rises with a temperature of 80 degrees Fahrenheit. Two of the sources are surrounded by walls, as at the Tabghah spring, apparently to feed a mill. The water is sweet. Here, according to a tradition of the seventh century, was the feeding of the 5,000". A drone captured this view of Tel Rakkath, viewing it from the north side. On the left is the Sea of Galilee. The northern side of Tiberias is seen in the right far background. Highway #90 crosses on the east side of the hill. A closer view of the site is below. A dirt road climbs up the northern foothills, and can be used to ascend to the top of the hill. It continues up to Tiberias. The top of the hill is mostly barren, and was not yet excavated. 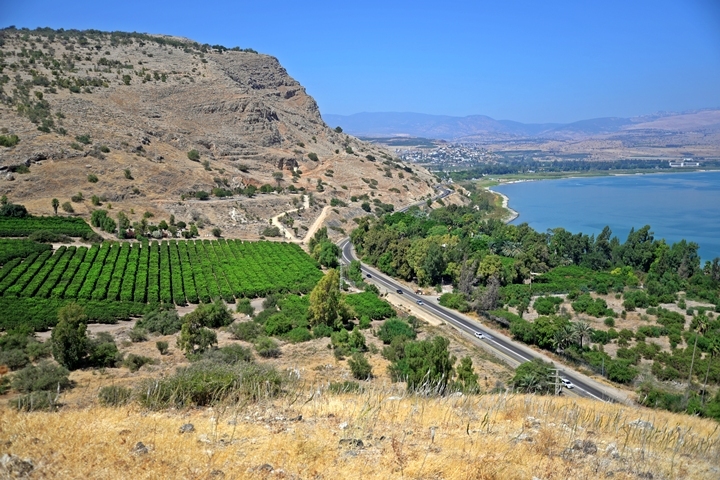 From the top are excellent views of the Sea of Galilee and the north side of the city. The following photo is a view of the Tel (Mound) from the south. We attempted to climb up the foothills from the south side. A mistake... the steep ascent was a challenge in the heat of the day, and the potential threat of snakes required caution. Eventually we realized that the dirt road on the north and west is an easier way to climb up the hill. Along the walk up the hill the views are indeed rewarding. 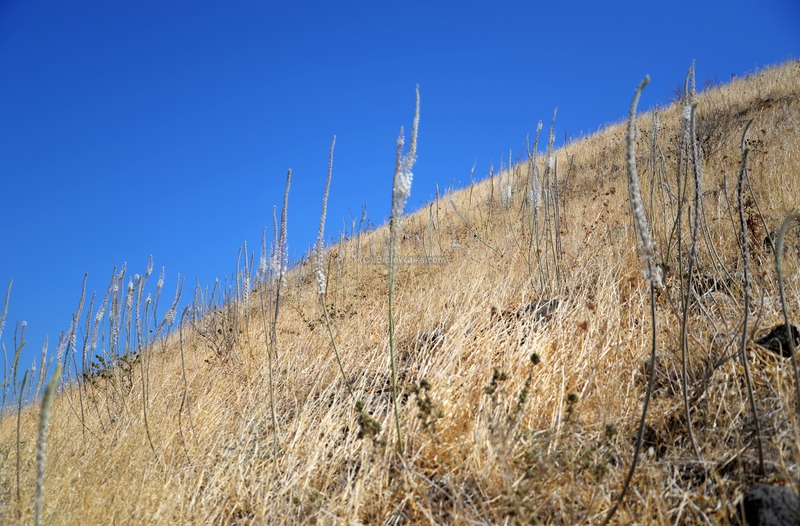 During the last weeks of summer, the hillside is still covered by dry weed. We did notice that along the makeshift trails are traces of walls, especially closer to the top of the hill. 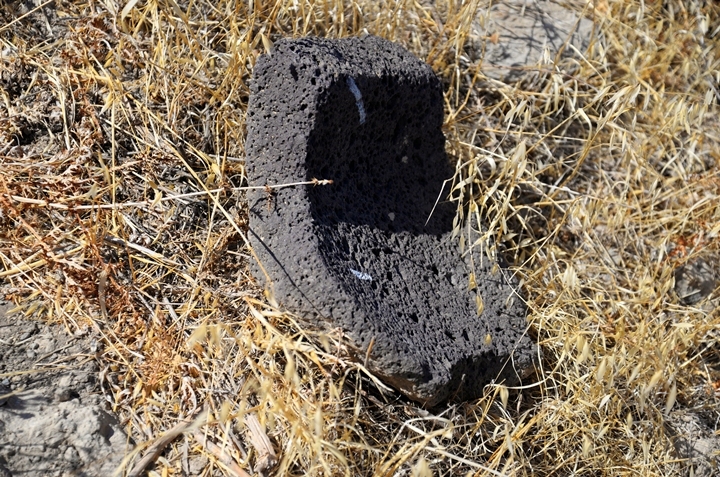 A fragment of what seems like a Bronze age clay brick was seen along the way up. During this time of year there are hundreds of flowering squill (Hazav) plants. The squill flowers at the end of the summer, signaling the beginning of the Autumn season. A closer view of these tall flowers is in the next photo. Their bulbs hold the ground firmly and are useful as markers. The squills are found in many ancient sites, as the bulbs were used to mark the boundaries between houses and lots. 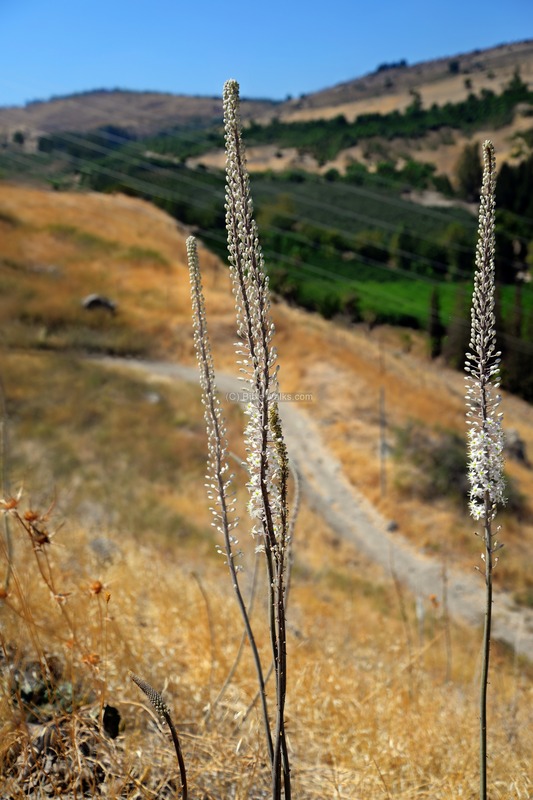 A legend has that Joshua used the squill bulbs to mark the borders between the tribes. A fragment of a basalt stone was seen on the northern foothill. 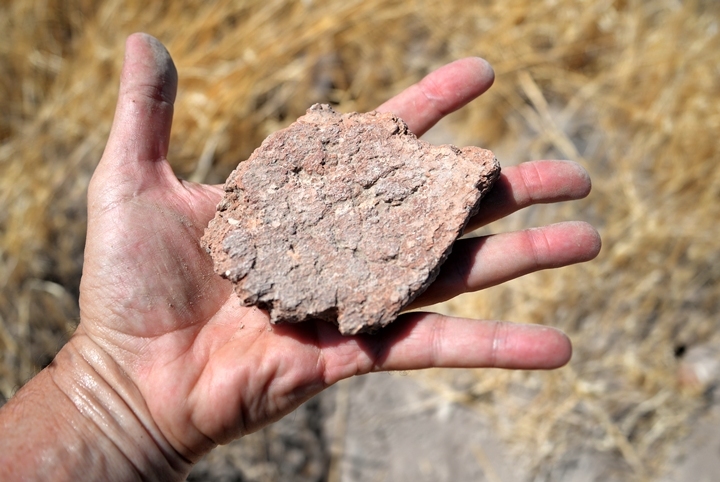 It was either used as a vessel or grinding base. The way down along the northern face was even more difficult. The north side of Tel Rakkath is seen here. Notice the steep cliff which provided a natural protection to the ancient fortified city. A dirt road ascends to the top of the hill and can be used to climb up to the top. A closer view of the northern foothills is next. Ruins of an old house is located here. Next is another view of the old house, among a lone palm and a lone cypress tree. 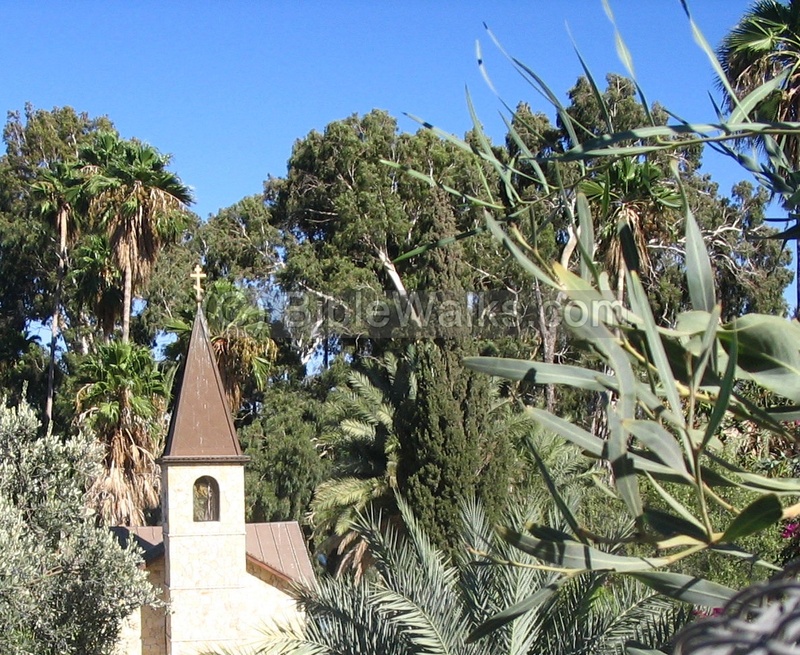 Notice that the trunks of both trees are black, due to the fires that erupted after the missile attack from Lebanon on August 2006. A view from the side of the Tel towards the Rakkath spring, located on the shore. On the left background are the cliffs of Arbel. 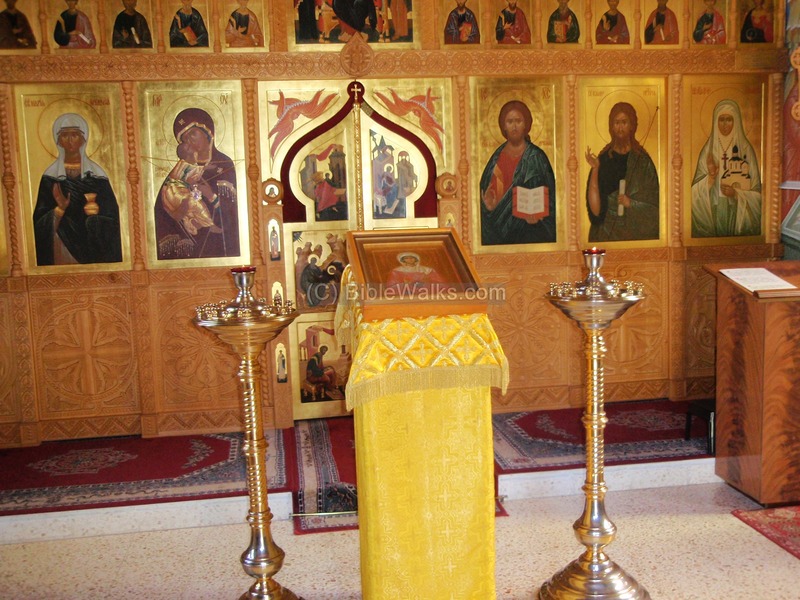 In the area near the Rakkath spring is a small Orthodox church. Inside the church, on the front, is the "Templon", a decorated covered screen with icons and paintings, which separates the hall and the holy place behind it (the altar, or sanctuary) behind the center door. 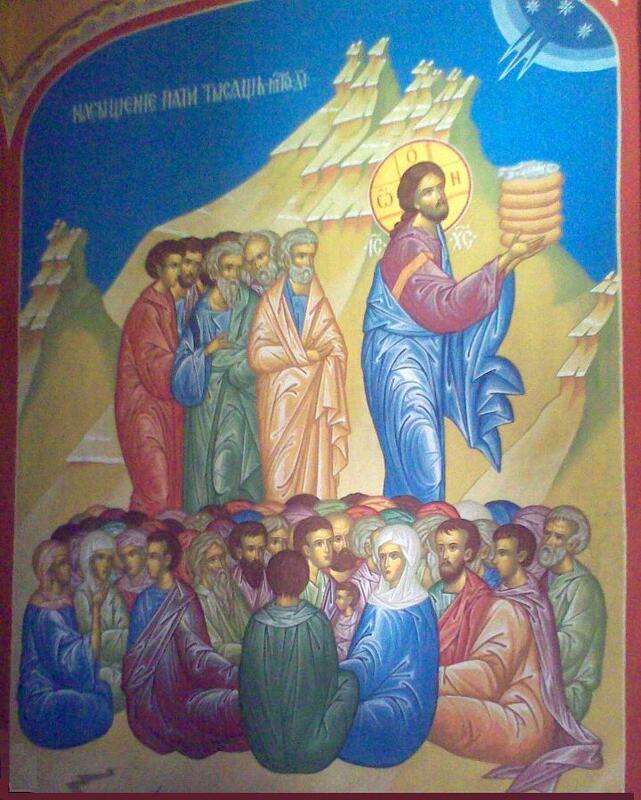 On the wall is a painting of the miracle of the first feeding of the multitude - feeding 5000 with 5 loaves of bread and two fish (Mathew 14: 13-21; Mark 6: 30-44; John 6: 1-15). A view of the valley of the Rakkath stream is seen here. The valley was one of the ancient routes leading to west towards the Netufa Valley into the heart of the country. This road bypassed the Arbel mountain, here on the right side, from its south side. 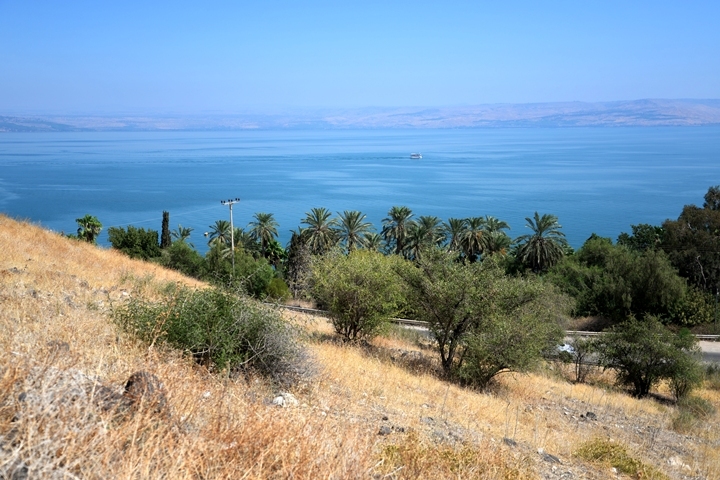 The gradual descent from the Galilee to the Sea of Galilee was an advantage during the ancient times. 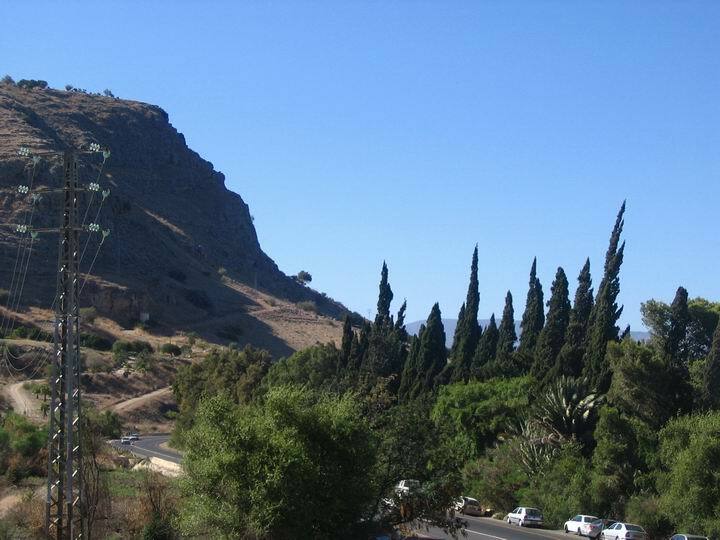 A south-west view of the valley of Rakkath is seen below, as seen from the road to Tiberias. Tel Rakkath is located on the hill on the south side of the creek, close to the lake. 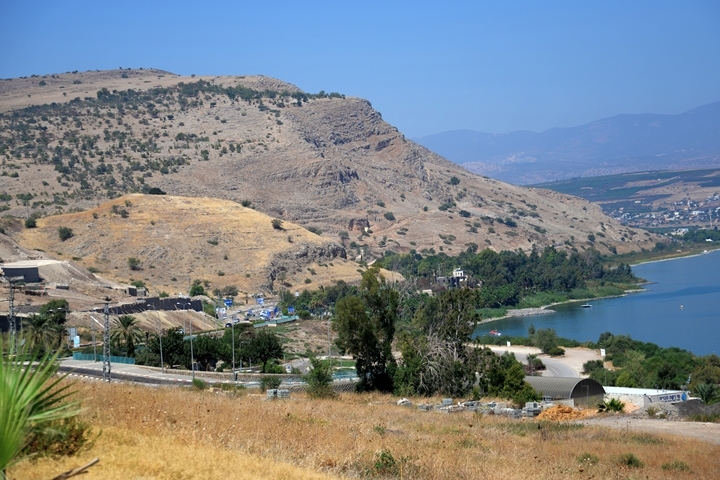 Tel Rakkath is situated just above highway #90 that connects Tiberias to Magdala, seen here in the far background behind the foothills of the Arbel mountain. This busy modern highway was also an important route during the ancient times. A closer view of the southern foothills of the Arbel mountain is in the next photo. A Christian cemetery is located at the foothills near the highway. This text describes the area belonging to the tribe of Naphtali (Naftali). 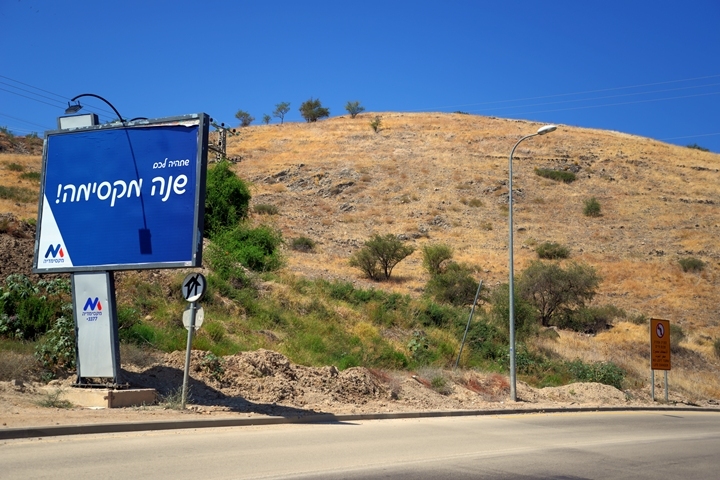 The city is located between Hamat Tiberias (south of Tiberias) and Tel Kinneret. This description was the basis of the identification of the site with the Biblical Rakkath, which according to this text was a fortified city. And the fortified cities were Ziddim-zer, and Hammath, and Rakkath, and Chinnereth"
The Talmud - the 5th century AD books of religious practices, an extension and interpretation of the earlier texts of the Mishna - has another identification of Rakkath: Sepphoris (Zippori). It writes: "...Rakkath is Zippori. And why has it been called Rakkath? Since she stands higher as the bank of a river". 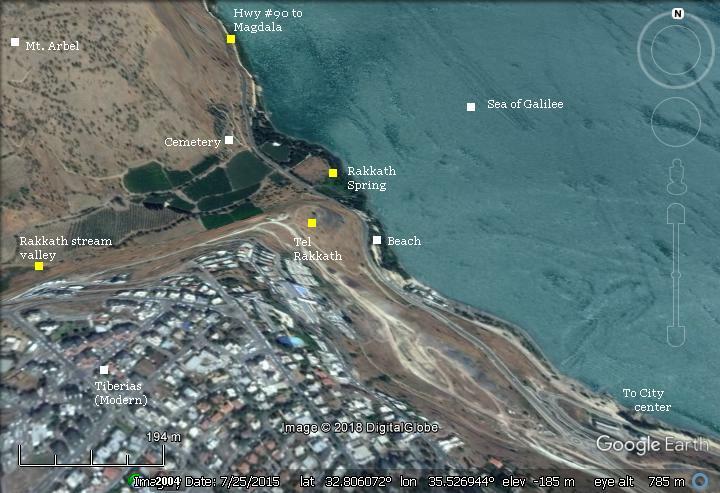 However, in another text (Megila 2,2) is locates Rakkath near Tiberias. Kuneithra (Quneitra) - the name of the place in Arabic. Means "small bridge".